Features:The Electronic Model 3200 goes even further than the Model 3100 - with on-board recording and playback capabilities. Also, Bluetooth® technology lets you transmit sounds real-time to your PC, which can then be further analyzed, attached to medical records, or reviewed online with colleagues. Free heart & lung sound visualization software, and available software that identifies suspected heart murmurs with a Class I indication. 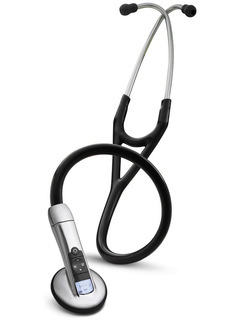 It all adds up to an exceptional listening experience compared to acoustic stethoscopes.